Shkodran Mustafi’s first-half header and a late Bastian Schweinsteiger strike got Germany off to a winning start at UEFA EURO 2016 with a 2-0 victory over Ukraine in their Group C opener on Sunday. With Ukraine boasting their biggest name in the dug-out in the legendary Andriy Shevchenko, now one of the national team’s backroom staff, Germany could have been forgiven for expecting an easy ride in Lille. Yevhen Konoplyanka soon served notice there is talent in the current Ukraine squad, however, in the shape of a crisp drive Manuel Neuer turned away smartly. Had Jonas Hector been a natural right-back rather than left-back, the 1. FC Köln defender would surely have given Germany the lead, but skewed his shot with his weaker foot from Thomas Müller’s intelligent knockdown. Mustafi also used his head to good effect, rising to direct Toni Kroos’ devillishly delivered free-kick into the top corner. 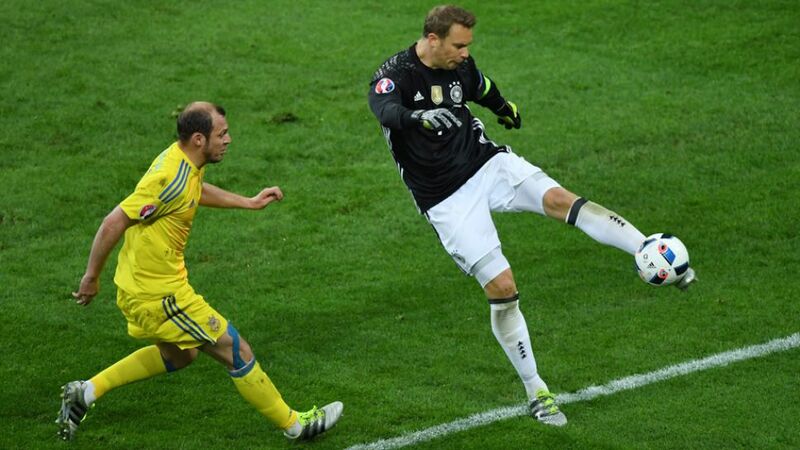 Neuer and opposite number Andriy Pyatov traded saves, the former brilliantly turning a close-range Yevhen Khacheridi header over his bar, the latter standing firm when Sami Khedira broke clear of the yellow-and-blue-clad back four. When Neuer was beaten eight minutes before the break by Konoplyanka’s shot, his FC Bayern München team-mate, Jerome Boateng, somehow cleared the goalbound effort with just centimetres to spare.